I was reading an article recently and it came to me that It just so happens that there are some correlations and some disconnects between eating organic food and having a good diet of organic business strategies to improve your health. You want to eat healthy, and you know that means choosing a variety of fruits, vegetables, whole grains, and lean protein but as I wandered down the aisles of my local market this week checking out the fresh produce, meats, and dairy products, I realized that there's another choice to make: Should I buy organic? Advocates of organic food say it is safer, possibly more nutritious, and often better tasting than non-organic food (Some might take exception to that) but they also say organic production is better for the environment and kinder to animals. But more and more shoppers seem convinced of this and even though organic food typically costs more (sometimes a lot more) sales are steadily increasing and many experts say there's not enough evidence to prove any real advantage to eating organic foods. Even though many of us choose to pay more for organic products and well as many marketing strategies that may or may not provide real benefits the benefits of having a healthy diet of Organic marketing strategies are real. Organic marketing strategies are more economical simply because they provide longer term benefits that Paid advertising do not - but just like starting and benefiting from a healthy diet it takes time to start realizing the full benefits. Organic strategies attract a more serious and focused customer who is looking to fulfill a particular need and not just a curiosity. Organic strategies can provide benefits for months or even years where paid search or advertizing only benefits you as long as you are paying. Paid advertising without an organic strategy can become an addiction that forces you to keep paying for your dependence and increases with your craving for more and more to satisfy your goals. Organic reach is defined as the total number of unique people who were shown your content through unpaid channels where paid reach is the total number of unique people who were shown your post as a result of ads. Organic content is part of a natural ecosystem where there is no need for constant monetary intervention, a website and its web pages are found, engaged and socialized with, and a business’s marketing objectives met. Like natural ecosystems that are used by people and companies for gain, they need to be maintained and nurtured as these ecosystems evolve and change but mostly their life and success is ongoing, long-term and self-sustaining. Organic Search (SEO) is a longer term investment for your company but pays big dividends. Search engine results pages (SERPs) can be divided into two parts, organic search results and paid search results. High rankings on organic search engine result pages is critical and is the primary goal of search engine optimization. Organic search results comprise the majority of clicks from search engines, with many sources claiming as much as 80% of all search engine traffic. 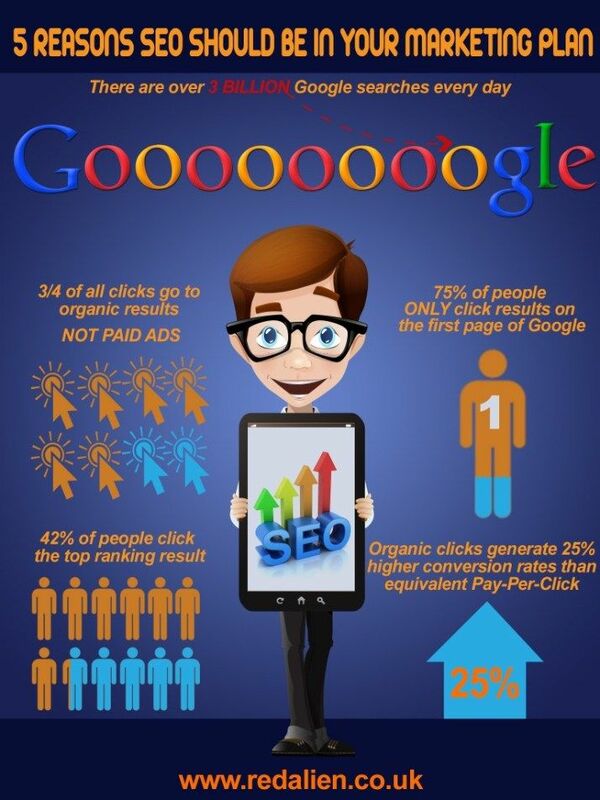 70 percent of links that search users click on are organic results. 70 percent to 80 percent of search users ignore paid search ads. 75 percent of search users are not clicking past the first page of search results. Organic search traffic produces 25 percent higher conversion rates than traffic driven by equivalent paid search traffic. Insights from BrightEdge’s Data Cube reveal that the clear champion of website traffic is organic search. Overwhelmingly, organic search trumps other traffic generators, driving 51% of all visitors for both B2B and B2C businesses. Another advantage of organic search marketing is that organic listings have a much higher level of trust than do paid listings. Most people that do organic searches know that search engines have a say in what shows up in their searches, and that paid listings are more about who is paying the most to have their listings shown. Top organic positions drive 50% more traffic than top paid positions and it also used to be that search rankings were solely keyword dependent and ranking for these keywords aside from being very expensive was about the only way to get sufficient reach. But today’s algorithms also provide ways that rank for quality content and phrases that increases your chances of being found and ranking higher in search. If you want to improve your SEO, you must have a strong content and organic marketing strategies (explained below). Strong SEO means developing a content strategy with a commitment to producing engaging, useful content for readers on a consistent basis. If you tell your story through compelling content, over time you’ll see your website’s SEO rise in searches and search rankings. Bottom line an Organic Strategy will build a long lasting web presence for your business. Invest in an onsite(your real estate) branded (social) community for employee and customer referral programs and testimonials that deliver customers right to your door (website). According to research by Implisit lead to deal conversions rates are lead by a wide margin by referrals converting the highest at 3.6% followed by leads from company websites and social channels at around 1.55% and found that lead lists, company events and email campaigns are the worst performing channels. In this article by Roger Katz posted at ClickZ Forrester’s recent lineup of 2015 predictions for the technology landscape stated that as social media "grows up," so-called "branded communities" will be making a comeback. What’s a branded community in this context? A managed community of brand followers and customers, usually on, or adjacent to, a brand website, glued together by familiar social digital behaviors and a commonality of brand interest. Why is this happening now and what does it mean for social marketers? As radical innovation on the leading social platforms slows down, and marketers become increasingly limited in their organic reach on social networks, brands are needing to move laterally to accommodate their customer-centered engagement needs in ways that social networks alone cannot accommodate. Does that mean that brands will not be investing in their social network presence? Absolutely not. Facebook and LinkedIn remain highly worthwhile "pay-to-play" networks for excellent targeted and personalized reach. But they are no longer reliable as the sole networks for organic conversations, or as a complete solution for supporting customer questions. Testimonials are a key tool to add credibility to your business. Search Engine Watchreports that 85 percent of consumers read reviews for local businesses. Dimensional Research reports that 90 percent of consumers say that positive online reviews had a direct impact on their buying decision. One of the most frequent practices is to highlight a specific customer review, or expert mention for your business. What better place to all this have these emanating from to broadcast across your social channels and the internet than your website. You can also highlight customer reviews for your business and use them as testimonials on your website and landing pages. The varied diet of Organic strategies I have mentioned here are great ways to improve the health of your business tremendously and build a healthy long lasting web presence. Let me know your thoughts and if I can help you improve your health. Imagine travelling all the way to the INBOUND 2014 conference and forgetting to exchange business cards with all the people you met. You’d be kicking yourself, right? You would’ve had jovial conversations with a bunch of interesting people and probably talked some serious shop. However, if you couldn't reconnect with any of them once you head home, you would've left real money on the table. Of course, this specific situation is all hypothetical ... but it's not so different than what's happening on many people's websites every day. We leave valuable business opportunities on the table because we fail to exchange details with people who interact with us on our website. I was certainly guilty of this. The truth be told, I didn’t even have a form on my landing page for the first 12 months. I felt really uncomfortable asking people to tell me their name and email address because I lacked confidence. I was the nervous kid at the school dance. When I finally mustered the courage to ask people for their name and email address in exchange for a valuable piece of content, people accepted in droves. My email list started growing to the tune of hundreds of new email subscribers a month. More importantly, every single client who has engaged my firm since then has downloaded content from our landing pages and been nurtured by the subsequent Bluewire News emails. You can read about the ingredients of a successful landing page or landing page copy tips, and even how to avoid completely screwing it up but let’s dive into the most costly mistakes I made (in the order I made them) -- hopefully you can avoid making them, too. I had my main navigation bar on my landing pages, which gave visitors a dozen different options above the fold alone, and I wondered why more people weren’t taking the specific action I wanted. I removed the main menu navigation bar and bam: No distractions and total clarity for the user. These ‘menu’ leaks are only leaks off your page, not leaks off your website, but it is still critical to fix since your window of opportunity to convert a visitor is limited. People's attention is very fickle, especially when they have multiple tabs open, emails, and offline distractions. Don’t lose leads by making it too confusing. I hear some people saying, “But what if users want to browse around the site and not be forced into a landing page form?” This is a great question and I am all about what is best for the user. So remember that your visitor has arrived at your specific landing page at their own will (and probably to try to solve a problem). They’ve clicked a Google search result, a social media mention, backlink, email, or menu item. Either way they are expecting to see what has been promised to them, not a myriad of things they haven’t asked for. Their priority is to complete that task. I believe that making this process as easy as possible is our obligation as marketers. Then after they’ve downloaded what they are there to access, by all means reintroduce the main navigation on the thank-you page so they can continue to browse around your website. This is a huge no-no in my book. I used to give visitors the choice to download the PDF, fill in a contact us form, or call us. Not surprisingly, visitors had to think too hard, got confused and vanished. Three options meant few conversions. As soon as I removed our phone number and contact us form and focused solely on delivering the promised PDF, conversions shot up over the 25% mark. These new contacts then entered our lead nurturing process of receiving our Bluewire News emails and our free templates. This is one technique that I don’t see too many people doing: Giving a preview of the offer on the landing page. Some marketers tell me that if someone can read the part of the PDF on the screen or sneak over to SlideShare to download it without popping in their email address, then you’re missing out on a lead. Hear me out though. If someone wants to harvest your content and bail, they’re going to do it anyway, so at least be a sport and show them your hand. If your content is good, they’ll probably change their mind and opt-in to get your content after all. Most of my landing pages convert at over 25%, and we manage a 7% website conversion rate. I personally feel this technique of including a SlideShare preview has been the most effective in conversions. If you’re only linking to your landing pages at the end of blog posts and on the sidebar, think again. Blog readers can be in a passive frame of mind, and it takes a lot of effort to switch people from consumption to action. On the other hand, people searching on Google are there to solve a problem. As you know, people will see organic results on the left side and the sponsored link results on the right. The organic results are where over 90% of us click, so that is where the action is and where I suggest focusing. A well optimized landing page will stand tall and proud on the first page of Google and it will effortlessly drive action-orientated visitors to you. In my personal experience, people in this “active” frame of mind are 20-30X more likely to take action and convert. Let me show you. A reader who reaches the template via call to action at the end of a blog post, like this, at the end of blog post converts at <1% for me. Whereas someone searching who reaches this template via their Google search will convert at 29%. People searching for something have an active intent compared to someone who is passively reading a blog post or cruising social media. Mistake #5: Not Having a Second Offer or CTA on the Thank-You Page. It’s a smart move to keep your primary offer nice and clean on your landing page and not confuse people with multiple CTAs. However, once you’ve given the promised content to the lead, you are wise to garner their support by asking them to do something whilst they are "hot." I always suggest to make sure you utilize the thank-you page to place another CTA or offer. I choose to ask people to share the content via a Click to Tweet link. There is no magic formula, and as a marketers, you should always be testing new things. The biggest testing win for me has been the discovery that “templates” are incredibly popular and they convert like crazy! The actual word “template” is included in 8 of our 10 highest performing keyword phrases and they convert at an average of over 20%. Of course Google has started encrypting much of this data in recent months, but I’m confident the lion’s share of the "unknown keywords" would include the word "template" and be reflective of the rest of the stats. Templates are also the most popular content on our email newsletters (they attract a 33% - 66% click through rate) and the most retweeted items too. Our best converting pages have all included the word “template” and it makes sense because people are looking for something they can pick up and use right away. This desire for utility far outweighs downloading another ebook that gets stacked on the pile of guilt that you must eventually read (one day!). If you kick the six costly mistakes I’ve made, you’ll attract more leads, customers and revenue -- and you can make it easier by downloading this free, easy-to-follow landing page design template. Social Media and SEO aren’t just different, in many ways they’re opposites. Social appeals to people. Search engine optimization appeals to a robot. The speed, the reach, the measurement and the content that performs well are all very different. Knowing the difference will help you decide what content to promote in which channel, how to spend your time, and where to set expectations. Here’s a breakdown of the differences (and similarities) between social media and SEO. Social: Although growing a following takes time, social media posts appear instantly and results can happen within minutes. Search: SEO is typically slow and uncertain. Even highly relevant pages take days to get indexed and rank. It often takes years to build up enough credibility to compete for the most valuable phrases. Social: There is virtually no limit to the number of people who may share a piece of content. If you’ve ever been part of a mini viral event, you know just how far and how fast things can spread. Search: The amount of traffic a page will get from a search engine will never exceed a certain number. That’s the number of people who search for that phrase each day. The search volume for the phrase is the maximum amount of traffic the page will get from search engines. Social: Content that stirs an emotional response often does best, especially emotions such as anxiety, anger, and awe. See Brain Science and Web Design Tips for more information. Search: Research-based content often performs best, such as detailed, how-to instructional posts, and articles that answer common questions. Social: Visuals perform best in social media. Images and video are the most shared content on the web. Posts with images generate 53% more likes than average on Facebook. Search: Long form text performs best. The average page that ranks high in Google has 1500+ words. See the Ideal Length Guidelines for more information. Social: Visitors from social media marketing are typically less likely to buy since they were likely browsing through a social network when they found you. But they are more likely to share and spread awareness. Social fans and followers often influence potential buyers. Search: Visitors from search are more likely to be ready to buy, but less likely to share and interact. These visitors enter with a specific purpose, need, or question. Social: Marketing with social media involves many short-lived actions. Most visibility and traffic happens within minutes. This is why social media requires a continuous, ongoing effort. Search: Once it’s working, search traffic can lead to durable visibility, creating an ongoing, passive source of visitors. Depending on the phrase and the page, high rankings may endure for weeks or months. Social: It’s easy to measure social engagement. Shares, likes, and comments are all highly visible. But it’s hard to measure reach. The total visibility and traffic of all social activity is not easy to report on. There are many platforms and each has its own reports. Social traffic reports in Analytics are not very accurate. Search: It’s easy to measure the reach in search engines. The total visibility and traffic from search is centralized in a just few reports, showing keyphrase, impressions, and clicks. But, it’s harder to measure engagement. Keyword data at the page level is no longer provided. It’s difficult to know which keyphrase led to which activity on the website. Social: High ranking content brings search traffic that can drive follows, comments, and shares. Social media profiles often rank high. Google Authorship puts social right into search results. Search: Smart SEOs know that ranking and links are the outcome of relationships. Blogger relations, PR, and many other search tactics are actually social activities. Skills such as list building, outreach, and pitching are critical to SEO. Like Peanut Butter and Jelly…They’re both about connecting with people. They both benefit from research and data. Social media and SEO come from different directions but end up in the same place: a meaningful connection with an audience. Hat tip to our designer over at Visual.ly for the infographic! If you are actively seeking to understand digital marketing you already have an idea of how complex it has become. And you might have also read a horror story or two about false prophets dressed up in outdated and/or less than effective or ineffective garb touting quick fixes and cheap ineffective marketing techniques they market to the unaware and uniformed. First of all if you are not familiar with a product or a service you should be seeking information and advice from various knowledgeable sources in order to make the right decision for you and your business. If you don’t, as with anything, you open yourself up to investing in subpar or ineffective products. Digital Marketing is an ecosystem where the seamless integration of a systems components is essential for its functioning - a central point where all the elements converge. Today you must approach it holistically. The complexities and constantly changing landscape of digital marketing takes the right tools, specialization and constant study to be able to properly navigate, participate and be effective within it. To help you better understand this complexity, here are a few points that highlight some of the intricacies of Digital Marketing and its constant evolution. Its location culture, ideals and its people make every business unique. Every marketing strategy, therefore, must also be unique and to do that you must understand your company and your market. You must have a strategy to generate interest for a specific product, service or idea. It’s an assessment of each individual company, and a constant work in progress in determining which forms of digital marketing will work best for you. Is your website up to date technologically with website design that is easy to navigate? Just to scratch the surface on updated search engine algorithms did you know that bad web design and poor navigation will get you poor search rankings. Search engines are now watching people’s habits in an effort to produce better search rankings. So with that thought in mind sites that have good content, navigation and design are rewarded with higher organic search rankings because they stay longer and navigate deeper. Compare that to a poorly designed web site that people simply land on the site and leave within seconds because of its look and or poor navigation – Google and the others as well, will now penalize poor design by lowering its ranking on the organic search lists. Did you know that it has become apparent that with the new algorithms used today, some types of link building can land you in trouble with search engines and possibly penalized you with lower page rankings and possibly being removed from search engine listings. Today, if you want to improve your search engine rankings and attract new customers you need to engage people with good relevant content. This engagement will create the type of indirect links that the search engines are looking for today through comments, sharing and social interaction in its many forms. It can’t be all about you anymore it also needs to be about what is important to them-How they feel about something and what is going to draw their interest. It is about bringing them to you not just you going to them. And don’t think of web traffic as just coming from sites like Facebook, Twitter and Google Plus –to name a few - Because these are just a part of driving web traffic as you will see in a report released by Sharaholic on Organic Search traffic vs. Social Referrals covering November of 2012 thru November of 3013. In the report they analyzed data collected over this 13 month period across their network of 200,000+ sites that reach more than 250 million unique monthly users. tracking the amount of traffic the top 5 search engines (Google, Yahoo, Bing, Ask, AOL) and 5 top ranked social media sites (Facebook, Pinterest, Twitter, StumbleUpon and Reddit) drove to publishers. On average, according to the report, social referrals accounted for just 15.06% with Organic search traffic accounting for 41.45%. But the importance for both is documented in a recent article on Search Engine Watch that research from Forrester tells us that social networks today have become a critical discovery platform and are now the second most popular channel for website discovery only behind organic search. Citations are defined as references to your business name and address on other web pages, even if there is no link to your website. Citations are a key component of the ranking algorithms of the major search engines. Businesses with a greater number of citations will probably rank higher than businesses with fewer citations. Are yours uniform and up to date? Today this could be defined as a seamless integration of system components which is essential to be able to function properly - a central point where all the elements converge. The coordination required to synchronize all the functions of a web site can be overwhelming. “The web page is the most important social media development of all time. This is a weighty statement... but it’s also a true one.” Says Steven Aresenault, CEO of One Big Broadcast. The world of Digital Marketing is constantly changing. Consumers are flocking to the Internet seeking information about their favorite brands and products. They want the immediacy of networking; they want the ease of web site posts; they want instant communication. Consumers are now spending their time--and their money--online. They’re seeking out company web sites, utilizing social media as a way to learn and buy. Social integration is linked to consumer awareness. Companies that embrace networking, blogging and more become part of an ever-expanding circle of accounts. They are connected directly to the demographics they need, bringing traffic to their sites. A business that isn’t integrated is a business that’s losing money. There are SEO and social automation platforms available that can save valuable time which translates into valuable resources. But the key to how they function is in their design and the team behind it who will be consulting on a consistent basis on changes and new developments and strategies that will keep you at peak performance. Measure, measure, measure. Analytics are an essential component required to measure the effectiveness of you marketing. You must be able to gauge where your marketing is being the most effective and adjust accordingly. Your marketing company should be consulting you on a regular basis to help you understand the information contained in the analytics that they provided and work with you on adjusting to increase you marketing’s effectiveness. One article I read that made a good point that a company that does not offer analytics is a company be should avoided-. Good advice. And another pointed out that if they don’t want to do an audit of your current marketing platform before they start making suggestions or giving you prices-Walk away-More good advice. As a business you must understand the enormous impact of all this is too great not to have some knowledge so you can at least ask the right questions and stay informed on a continual basis. This is not something that without some knowledge you just sign up for and forget-it is a process that must constantly be monitored and adjusted to maintain and improve its effectiveness. These are only some of the components that are involved in structuring and executing an effective online presence and digital marketing program. Content and strategies must be constantly changing and adjusted to keep up with new Technologies, Social Trends and Changes in search engines sophisticated algorithms. Hopefully this made you aware of the complexity of the rapidly changing digital world of marketing and that you will delve deeper and get specialized competent advice to help make the best decisions for you. Brands trying to split their time and resources between paid ads and organic content marketing should be aware that one may be more effective than the other. According to a survey by UX firm Bunnyfoot and Econsultancy, 36 percent of consumers didn’t realize the first few entries in Google SERPs were paid ads. This is an improvement from the 41 percent of people who couldn’t make the distinction last year, and it may have something to do with Google’s updated UX. Instead of a lightly colored box indicating search results were paid for, the current design puts small yellow “Ad” markers before sponsored entries. Consumers don’t like ads in sheeps’ clothingAs Brafton reported, web users are wary of native advertisements. People spend more than 15 seconds browsing web content 71 percent of the time, but that number falls to 24 percent when the reader gets the impression he or she is reading an advertisement. So marketers need to be careful not to come across as overly salesy. Instead, they need to provide actual value in the content they use to market their products and services. That principle extends to video content as well. Unruly Media conducted a study of Super Bowl ads to determine what factors accounted for TV spots’ popularity. It turns out that of the 15 most popular advertisements, only three featured celebrities. And of the 100-most shared Super Bowl ads of all time, only 13 percent included prominent people. Instead, the bulk of the beloved ads were “emotionally charged.” This is an important lesson for brand marketers to learn, as it indicates visibility, coverage and popularity are not equivalent to emotional resonance and interest. Rather than trying to purchase ads or create content that appeals to the largest group of people, content marketing should seek to resonate within a group of ideal and likely customers – whether through videos, social posts or organic content. With advancements in digital technology, consumers have the ability to be “tuned in” at all hours of the day. They have access to email, websites, and social media—regardless of their physical location. Ironically, this group of intentionally “tuned in” people can quickly become involuntarily “tuned out” by the sheer volume of digital interactions and their fleeting nature. So, how do you reach customers in a way that will cut through the digital noise? Adding tactile marketing to your existing digital strategies is a proven strategy to increase the overall effectiveness of your marketing investment. Tactile marketing has higher retention and response rates, with 79 percent of consumers acting on a brand’s direct mail piece immediately, according to a Print in the Mix survey. By using an on-demand printing API, you can seamlessly access print fulfillment directly from your marketing automation platform. Clients can manage, track, and report on tactile marketing initiatives in the same way they manage digital campaigns. Sending physical pieces such as direct mail, Every Door Direct Mail (EDDM), postcards, promotional items, and corporate gifts is as easy as sending an email. Research shows that 67 percent of Americans prefer printed materials to digital, and bringing the conversation offline through tactile marketing creates a stronger bond with customers and prospects than digital outreach alone. The response rate for direct mail is 4.4 percent, compared to email’s 0.12 percent. Determining when to trigger tactile marketing to support digital efforts can be made easier by evaluating a number of factors. If you rely on marketing automation to streamline your digital programs, here are a few examples of how to incorporate response-evoking tactile materials. Lead Nurturing: To reach key decision makers and ensure follow-up, trigger the sending of a dimensional piece, such as an iron cross mailer, when lead scores change. Loyalty Marketing: Use a printed piece to remind customers when they are eligible for redeeming award points, or gift them with a piece of swag for their continued business. Lead Management: Know what’s been sent and when prospects and customers receive the marketing so you can follow up in a way that’s personalized and relevant. Event Marketing: Send a personalized postcard to invite prospects to a webinar or roadshow. To reach a broader audience, skip the mailing list, and use EDDM to target consumers on entire carrier routes. Upsell and Cross-Sell: When a customer makes a purchase, trigger direct mail or whitepapers that features things like warranties, complementary products, technical documentation, or surveys. Conversion Optimization: Drive customers back to finish their purchase if they’ve left behind a high-dollar item. iProspect found that 67 percent of online searches are driven by offline messages, with 39 percent completing the purchase. Tactile marketing is the high-impact complement that works in synergy with digital marketing. It’s not about trading one for the other — it’s about striking a balance where they work together to create true multichannel campaigns. By Andrew Field President and CEO of PrintingForLess.com.